Penn State students and others were treated to a free, intimate performance by the St. Lawrence String Quartet last night in the Hintz Family Alumni Center. 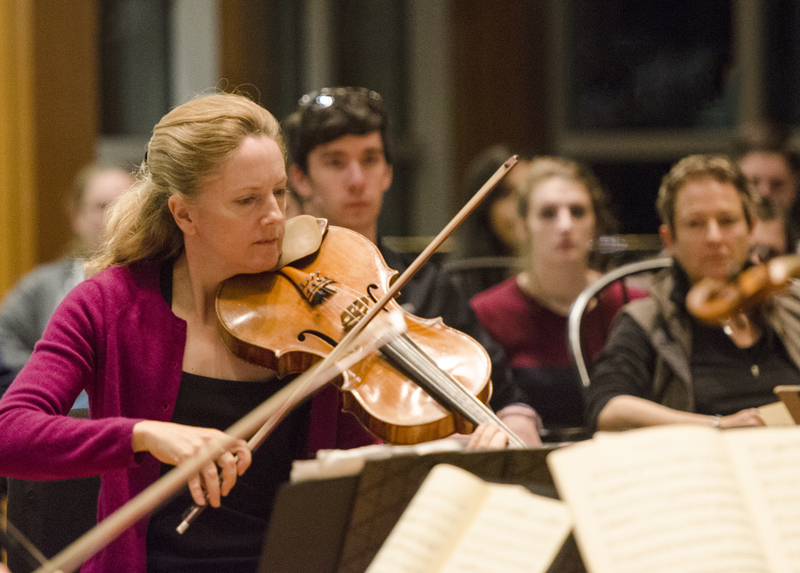 The SLSQ is in town for a concert in Schwab Auditorium tonight and, as part of the Center for the Performing Arts’ Classical Music Project, has also done some smaller events this week to help make classical music more accessible to students. Yesterday, for example, the quartet did a “dorm concert” in Atherton Hall for Schreyer Honors College students, and last night they played in our own Robb Hall. Robb Hall was set up in a theatre-in-the-round format, with the quartet right in the middle and many of the audience members just a few feet away. The performers dressed as casually as the audience did, and violinist Geoff Nuttall took time before each piece to talk about the music they were about to play. At the end, members of the quartet answered questions from the audience. Last night’s event was the first in a series of three “Classical Coffeehouses” organized by the Blue & White Society (the Alumni Association’s student members) and the Center for the Performing Arts. Pianist Jeremy Denk will perform in Robb Hall on Jan. 28, and Cantus, an all-male vocal ensemble, gives a concert there on March 31. Below are a few images from last night’s performance. Entry filed under: Uncategorized. Tags: Cantus, Jeremy Denk, St. Lawrence String Quartet.